How many times have you seen a film and felt that you were watching a great flick…until the end? Over the weekend I caught a great double feature with my brother (one that, thankfully, wiped the horrid taste of this summer’s ill advised double feature of Prometheus and Rock of Ages). After checking out Argo (review here), we headed to a little dirt theater (an antiquated theater set inside a strip mall with a huge arcade and play area in the front) called Flipper’s to catch Looper. I’m a huge fan of Rian Johnson’s work. Brick was one of those ideas (let’s play a teen drama like a hard boiled noir detective story) that was so good you couldn’t believe it hadn’t been done before. The Brother’s Bloom was a fun, breezy, con-men-in-action flick that felt like Dirty Rotten Scoundrels directed by Wes Anderson. Then, Johnson did two stints on Breaking Bad. The first of them, Fly, is often argued to be the best episode of the series. His second episode marked one of the most chilling moments involving not Walter White, but his wife Skyler. When I heard that Johnson was re-teaming with Joseph Gordon Levitt and getting time travel advice from Shane Carruth (director of the mindbendingly incredible Primer), I was on board immediately. The addition of Bruce Willis, Emily Blunt and Jeff Daniels sealed the deal entirely. I didn’t think it could fail. And technically, it didn’t. It just opened up a world where the story could have gone 100 different directions, and the one it chose was not the one I wanted to see. Since this blog isn’t Aint It Cool, I’m going to dispense with plot summaries. If you don’t know what it’s about, go read about it on IMDB. If you haven’t seen it and don’t want it spoiled, stop reading. If you work for Aint It Cool News, or any such movie review site, contact me here, I could use the work. Suffice it to say Looper is about a future where time travel has been invented and is used only by criminals to send people back from the future to be killed in a time when it’s easier to dispose of bodies who, at that time, technically don’t exist. My writing partner, Ben, saw Looper before me and said that for the first half of the movie, he thought he was watching one of the best films of the year. After they arrive at the farm where we meet the Emily Blunt character, he felt far less so. Ben and I often disagree on high concept movies. Usually, it’s one of us loving one half of it, and disliking the rest while the other thinks the entire thing was a masterpiece (this was definitely the case with Inception, me being the one who felt it was amazing all the way through). Sometimes it’s the first half of the movie that gets redeemed by the end. Sometimes it’s a great start that falls apart. Looper is the latter. The universe that Looper sets up is amazing. It’s filled to the brim with nooks and crannies I still want to explore. The problem is, that’s not what they did. They tried to combine a twisty reveal, that actually wasn’t all that twisty and a sacrificial ending that once they got to the farm, you could see coming a mile away. The sad thing is that all the actors deliver fantastic performances in the second half, but it just left me wanting to get back to areas of the story I found more interesting. Case in point, the best scene in the movie (and pictured above): The Diner Scene. I literally could have watched an entire movie of just more of this scene. The “if I knew then what I know now” concept has been done before, but the high concept conceit of this film makes the moment more electric than it’s ever been before. And I wanted more of it. I wanted more of Jeff Daniel’s Dude-Esque time traveling crime boss. I wanted more interaction between young Joe and old Joe. I wanted to see someone in this universe use the time travel in a different way than the criminals were using it (they get CLOSE to this with what happens with Old Joe…but there could be so much more). The problem lies with the MacGuffin of The Rainmaker. The movie could have tonally gone two ways after the set up: character driven emotion or plot driven action. The movie tried to do both, and unlike Argo, it did not know how to balance the two. And that’s what makes this such a disappointment is that the setup is soooooo great! But this definitely seems like the exact movie Johnson was attempting to make. In fact, by the end of the film, it almost seems like the Time Travel was added just to spice up the farm story. So that brings us to the question: what do you think is worse? Half of a GREAT movie, a whole DECENT movie, or no movie at all? In the case of Looper, I definitely want to continue to have that first half of the movie, if for no other reason than I would love to see side stories set in that universe. A sequel that gives us a little more of what is going on…that is too delightful to even ponder. I think there are a few kinds of disappointing endings. For me, the ones that hurt the most are the movies that don’t remain true to their start. A well known movie that does this is The Matrix. For 2 acts of the movie, we’re taken on a smart, philosophical journey where the special effects service the story and the characters. It’s a thinking man’s sci fi along the lines of Blade Runner. Then we hit the end, and all intelligence is removed in exchange for a mindless (albeit visually impressive) showdown involving guns, explosions, and bullet time. It’s like the movie gets a lobotomy. Do I mind that kind of action? Not at all. Zombieland is a great example of a fun, super stylish flick that I enjoy beginning to end. Why? Because Zombieland never presents itself as anything else. The Matrix does. And it’s a different kind of unsatisfying ending than Looper. 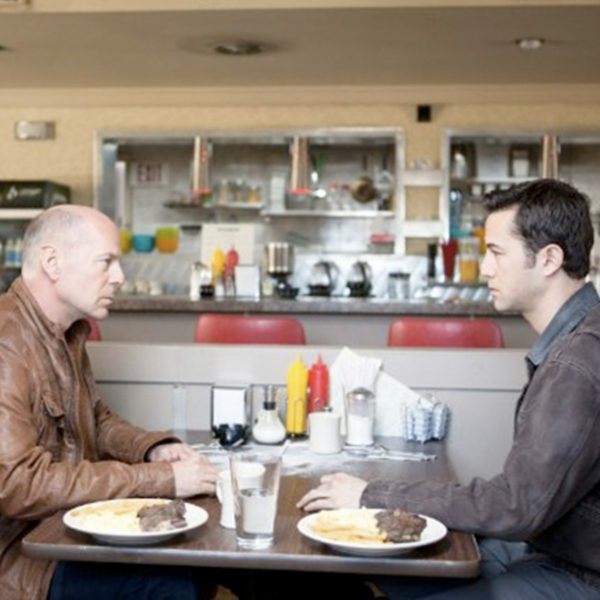 Looper is consistent with what came before, but the story goes to a place that isn’t as compelling as what preceded it. And that’s yet another type of unsatisfying. A lot of people were extremely unhappy with the end to Spielberg’s AI. I actually enjoyed it, but I understand the criticism. Yet, AI ends exactly as the story sets it up to from the very beginning. The Pinocchio parallels are so prevalent during the first 2 acts of the film, I was surprised that anyone was caught off guard by the ending. David has to become a “real boy”, because that’s what happens in Pinocchio. That’s what makes it so hard to recommend or caution against viewing certain movies. I think everyone should go see Looper. It’s smart sci fi from an extremely talented director and writer and we need more of those types in Hollywood. Plus, it spurs some great time travel conversation. And maybe this won’t be the last we see of this universe, which would be the best ending of all. "I wanted more of Jeff Daniel’s Dude-Esque time traveling crime boss. I wanted more interaction between young Joe and old Joe. I wanted to see someone in this universe use the time travel in a different way than the criminals were using it (they get CLOSE to this with what happens with Old Joe…but there could be so much more)." I'd rather see half of a great movie if the reason was the filmmakers were taking big risks at elevating their genre and they got in over the heads. Because, hopefully the could learn from it and come back with a masterpiece. A decent movie is usually playing it safe and doesn't bring us something new or challenging. But I guess it's what you're in the mood for at the time. It's all about managing your expectations when approaching a story.